Santa Monica police are offering up a new PSA suggesting that stopping for stop signs while riding a bike is child’s play. And the best way to ensure you’ll get home to yours. It’s not like their message isn’t reasonable — both the law and common sense dictate that we should observe traffic signals just like anyone else. But while they’ve undoubtedly scored points with bike-hating residents, they could have done a lot more good by focusing on the need for motorists to pay attention and drive safely around bike riders. Which is what share the road really means, despite the way some drivers — and police departments, apparently — try to twist it these days. After all, even the most dangerous cyclists pose a risk primarily to themselves, while dangerous drivers pose a risk to everyone around them. 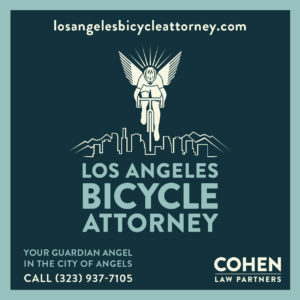 I don’t have any records on what may have caused bike injury collisions in Santa Monica. But neither of the two bicyclists killed in Santa Monica in recent years ran a red light or stop sign. Antonio Cortez died after riding into an open car door while allegedly riding drunk, while Erin Galligan was run down from behind by while riding home from work on PCH. Even if he was as stumbling drunk as SMPD officials implied, Cortez would probably still be alive today if a driver hadn’t left his car door open in violation of California law. And to the best of my knowledge, no one has ever suggested that Galligan did anything wrong, other than occupy the same road space as the speeding hit-and-run driver who killed her. Maybe the SMPD’s next bike safety videos should focus on closing your damn car door and not running away like a coward after you kill someone. Then again, this is the same department that has promised to crackdown on scofflaw cyclists more than once. Even though they can’t legally focus enforcement on specific violators as opposed to violations. That is, they can legally ticket everyone who rolls stop signs, for instance. But they can’t direct their enforcement towards cyclists as opposed to everyone else on the road. As long as we’re sharing videos, here’s one from the Encino Velodrome’s recent Swap Your Legs Race. Meanwhile, a great video says it’s time to fix LA’s broken sidewalks. And even our Twitter-using mayor liked it. The Daily News is the latest to notice that current LA law bans kids playing on or near streets. LA’s first protected bike lane has already seen better days. How many people get to work car-free in your neighborhood? 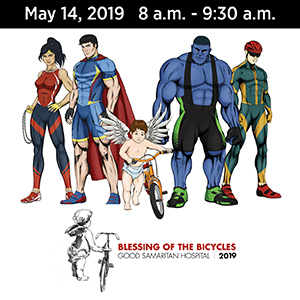 A writer for City Watch says the Pacoima Wash bike and pedestrian pathway recently approved by the San Fernando City Council has the power to transform the area. 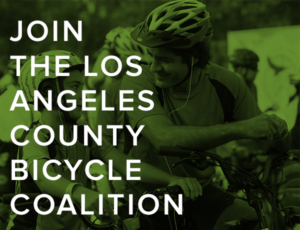 Zev says you’ll soon be able to sponsor your own section of bike path in LA County. Drivers can — and should — cross into a bike lane to make a turn, even when there’s a solid white line. California law requires drivers to make a right from the lane closest to the curb, and never turn across a bike lane. Fair warning to Los Angeles, as Oakland agrees to pay out $3.25 million to a cyclist seriously injured after hitting a pothole. The city had received numerous complaints about the pothole-ridden road but failed to fix it. Across the bay, San Francisco is on its way to becoming a bike utopia. How bicycling helped build Kickstarter. A new helmet attachment promises to keep you cool by soaking your head. No, really. Turns out the wicked witch of the Wall Street Journal was wrong, while famed lawyer Alan Dershowitz says it’s time for vigorous law enforcement against reckless drivers before they kill someone, not after. Drivers are at fault for injury collisions with bicyclists in a Georgia county two-thirds of the time. But why did they illustrate the story with a crashed motorcycle? A documentary maker for the BBC moves to LA, but gives up bicycling to work due to “distracted drivers going 50 mph in the dark.” But isn’t that half the fun? Thanks to Jim Pettipher for the heads-up. Funny how often totally insane cyclists attack perfectly innocent motorists for absolutely no rational reason. Seriously, no one should ever attack anyone else on the roadway or use their U-lock as a weapon. But something tells me there’s probably another side to stories like this. The owner of Soigneur magazine looks at five up and coming bicycling groups, and manages to be only somewhat offensive, particularly in regards to women riders. A writer for the Guardian says cyclists aren’t the enemy, and it’s time to end the us versus them mentality. An Australian writer suggests bike cams have been beneficial, but oddly worries about privacy concerns even though nothing that occurs in public view is ever private. Your next helmet could look like an alien brain if you’re willing to spend more than $1000 for the privilege. Finally, after an Aussie BMW worker calls for intentionally dooring cyclists and posting the videos online, the story somehow devolves into a debate over licensing cyclists, rather than protecting them from illegal assaults by bike-hating jerks. 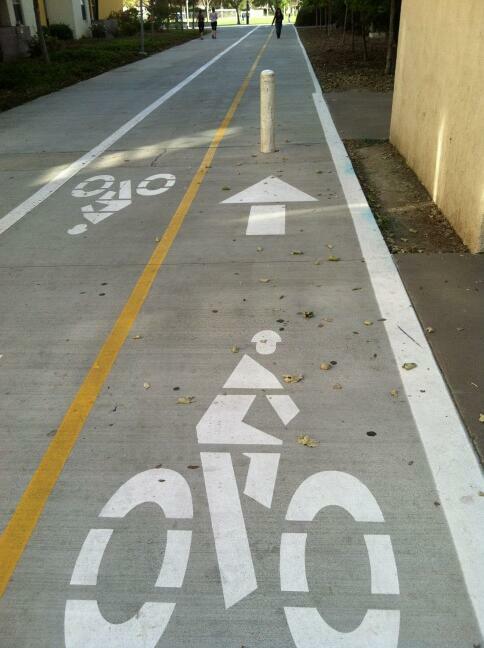 And Boyonabike found this bike lane fail at Cal Poly Pomona. Are they trying to tell us something? The Red & Black article was about all two-wheeled vehicles involved in wrecks, us and the ICE-driven included. Santa Monica has always been hostile to cyclists–It’s the most hostile city in California. If you are not aware–It’s the only city that has a special city code that makes it a Misdemeanor (crime) to ride a bicycle on the sidewalk and they do enforce it. 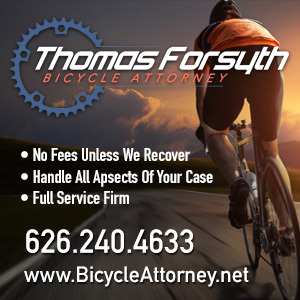 Many cyclists have found themselves in criminal court over the years. If you are on a bicycle in Santa Monica, you must make a full stop and touch the ground with one foot, even if brief. I have seen cyclists on Broadway stopped by unmarked cops and cited in the past year. These citations were in addition to the usual traffic police citations for speed, stop sign, etc. civil code violations. It was a banner citation season for the Santa Monica Police Department. Later in the Newsletter, an article addresses how financially sound the City of Santa Monica is, and that City Employee Pensions are secure unlike other cities in the United States. Last month the City of Santa Courthouse moved the Traffic Ticket Citation Window out of the courthouse building to the street with a walk-up window, to make it easier and more efficient for residents cited to pay their citations. The walk-up window is just around the corner from Santa Monica Police Headquarters.